The Colonial Marines Season Pass promises more content than you can shake a facehugger at. For better or worse, DLC is a pretty big fixture of the gaming landscape these days. For proof, one needs look no further than the DLC Season Pass, each promising a wealth of additional in-game content at a discounted price. Many publishers are moving quickly to adopt this early-purchase model for their games, including Sega's upcoming Aliens: Colonial Marines. Listings for the PC version's pass have appeared on Amazon, Gamestop, and Green Man Gaming, suggesting that Sega and Gearbox have a great deal more planned for the sci-fi shooter. With prices ranging from $27 to $30 per listing, the pass offers a 33% discount for four additional content packs. While the exact nature of each pack isn't clear, the listings promise that campaign content, multiplayer levels, and even gameplay modes will all be included. 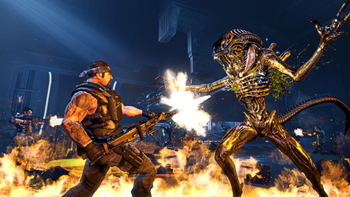 All passes are provided for the Steam version of Colonial Marines, although the description notes that players should download their content through an in-game store to avoid being charged by Valve a second time. A season pass for Colonial Marines was practically inevitable, considering that it wouldn't be the first Gearbox game to do so. I'm not entirely certain Aliens: Colonial Marines DLC will provide as much variety as something like Borderlands, but the prospect of dedicated campaign content certainly does intrigue me. It won't be long before we find out how deep the hive goes; Aliens: Colonial Marines will launch on February 12th, with a DLC schedule running from March to Summer 2013.